So close. 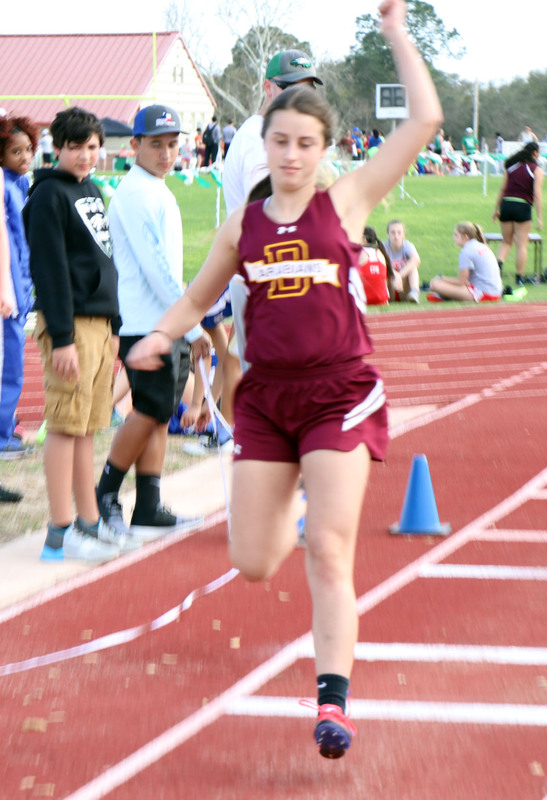 The Devine JV Arabian track team finished only seven points behind meet champion Jourdanton at the Daetwyler Relays in Jourdanton last Thursday afternoon. Team standings: 1st-Jourdanton-146, 2nd-Devine-139, 3rd-Carrizo Springs-99, 4th-Pleasanton-65, 5th-Karnes City-52, 6th-Poteet-46, 7th-Beeville-37, 8th-Nixon-Smiley-0. Arabian results:100m Dash—4th-Hannah Stolzman-14.59; 200m Dash—1st-Andrea Garcia-29.11, 2nd-Allison Stevens-30.60, 5th-Myla Miles-31.86; 400m Dash—4th-Audrey Miller-Velasquez-1:13.99, 6th-Victoria Gonzales-1:15.70; 1600m Run—3rd-Grace Singleton-6:44.11; 3200m Run-3rd-Singleton-14.44.34; 300m Hurdles—1st-Dawn Morris-58.28; Long Jump—4th-Stevens-12’10”, 6th-Stolzman-12’0”; Shot Put—4th-Khali Key-25’4”, 6th-Mackenzie McClellan-24’11”; Discus—3rd-Key-69’0”; Triple Jump—1st-Stevens-28’7 ½”, 2nd-Victoria Whitaker-28’1”. Relays: 4x100m—2nd-Penelope Cruz, Stolzman, Miles, Stevens-56.12; 4x200m—1st-Cruz, Miles, Stevens, Garcia-1:59.34; 4x400m-1st-Miller-Velasquez, Gonzales, Whitaker, Garcia-4:55.76. The high school teams do not participate in a meet during Spring Break but each will compete in their own meet at Warhorse Stadium on Saturday, March 24. The schedule for the Warhorse and Arabian Invitational will be in next week’s Devine News.